Red HeartWith Love Yarn, approx. 125-150 yds. Gauge: 4 dc = 1"
Your circle should measure about 4 1/2" across now. Fasten off and switch to white yarn. Join with sl st in any back loop. Be sure to not do this last row too tightly or your hat may not fit you! Row 23: Ch 1, crab stitch around (also referred to as reverse sc). Sew in ends and make your pom pom for the top of the hat! 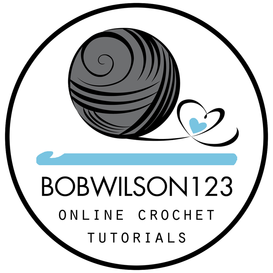 If you don't know how to make a pom pom there are many tutorials on youtube you can watch. I use my hand to make my pom poms, wrap the yarn around and around your hand until you think you have enough yarn on your hand, lay out a long piece of yarn (approx. 18"). Carefully slip off the yarn from your hand and lay on top of the long piece of yarn, tie a knot and knot it again. Using your tapestry needle sew the long yarn ends into the pom pom over and over, sometimes I even add a dab of fabric glue or elmer's school glue to the center. If you use glue make sure it’s only applied to the center, this is important because if you get glue on the outside of the pom pom it will dry hard. Cut through all your loops and trim up your pom pom. Sew on to top of hat. Sew on decorative buttons and fasten in any remaining ends. Hello!! may i ask? if i want this to make for an adult man what changes should i do?? Hi Daniella, I haven't yet worked out larger sizing but you could try going up a hook size. If you do, I would love to know how it turns out. okkk i will try thank you!! hello!! i have finished it! !actully i needed a size hook smaller 4,00mm because it the tarn was quite thick.It came out great!! I would like to print this pattern out for travel, but I don't see a printer friendly button on your page, do you have a PDF version? I am sorry, I do not have a PDF version but you should be able to print from your browser menu. 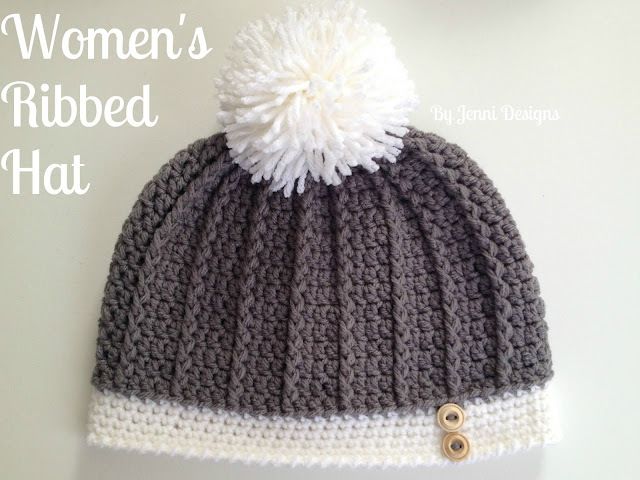 Hi, I currently have 2 different free slouchy hat patterns. I copied the links for you below. Hi, I am measuring 5 1/2" after the 5th row. I'm using an H hook with Caron medium weight yarn. Should I use more tension or go down a hook size? Thanks! Hi Sumayyah, I would try and go down a hook size and see how that works out for you. Hi. I'm having lots of problems with this pattern. I'm on round 4. I get too many front post. I have taken this apart so many times I've lost count. I do have 34 D.C. In round 3. I am doing the 2 D.C. Then 1 fpdc. Any help you can give would be great. Is there any way you can send a photo to me on facebook or by email @ byjennidesigns@gmail.com? It would be much easier for me to help. Hi Jenni! What size is this hat? This hat is adult women's size. Hi Michele, I received your message on facebook yesterday and replied there. Please let me know if you need further help. Hi, my hat is making just a larger and larger round circle. All my counts are right. What is wrong? Hi Julie, It's hard for me to tell what might be going wrong without seeing your hat. Are you joining to the ch 2 or the first dc of the row? In round 6 if you ch 2 and dc in same stitch how can you end up with same amount of stitches as round 5? Seems as this will increase each row if you join in ch2. What size hook did you use, please?